"Compassion," oil on wood, 48 x 36, 2017. Compassion is a painting about the connection between all life on this planet. We live on this rock that flies through space that happens to be at the perfect distance from a star that's the perfect temperature and brightness for us all to enjoy this atmosphere and time we have on this earth. For us to war between ourselves over the petty differences while we all have the same basic needs and experienc of life; birth, life, family, happiness, sadness, death.. It's absurd. We need to come together through a space of compassion. Meditations is a series inspired by my experiences I go through living my life. These are paintings based in creativity, explorations and philosophy. They are all unique dives into a concept, following the path wherever it may lead. images and concepts come to light and show themselves to me. The storyline and narrative almost build themselves. I start these works with no destination in mind, only a feeling that I need step out on a journey. During the painting process, I won’t know where the art is going or even what I’m doing. I turn the need to know and to control off, and free-fall through the open spaces of presence and in-the-moment decision making. The beautiful thing is while I don’t have a plan, I feel as though every little step is exactly as it should be. I feel sharp, in the zone and alive. These paintings are an act of freedom and adventure. 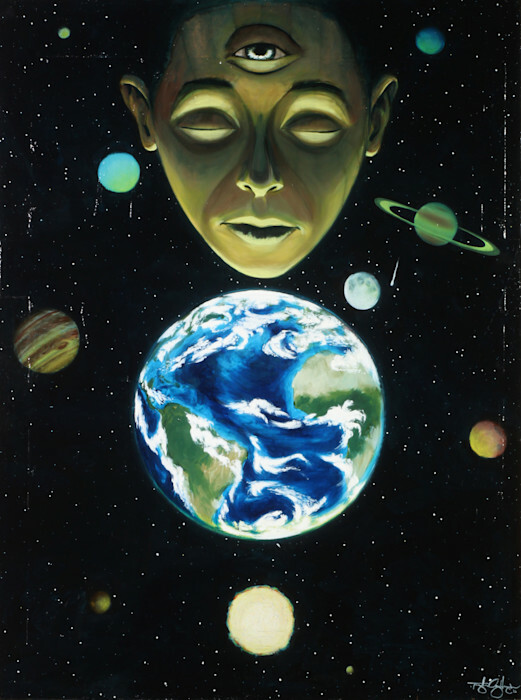 Surrealistic "Consciousness" painting as fine art reproduction or original artwork by Southern California Artist, Taylor Gallegos. Consciousness is a painting about the connection between all life on this planet. We live on this rock that flies through space that happens to be at the perfect distance from a star that's the perfect temperature and brightness for us all to enjoy this atmosphere and time we have on this earth. For us to war between ourselves over the petty differences while we all have the same basic needs and experienc of life; birth, life, family, happiness, sadness, death.. It's absurd. We need to come together through a space of compassion.